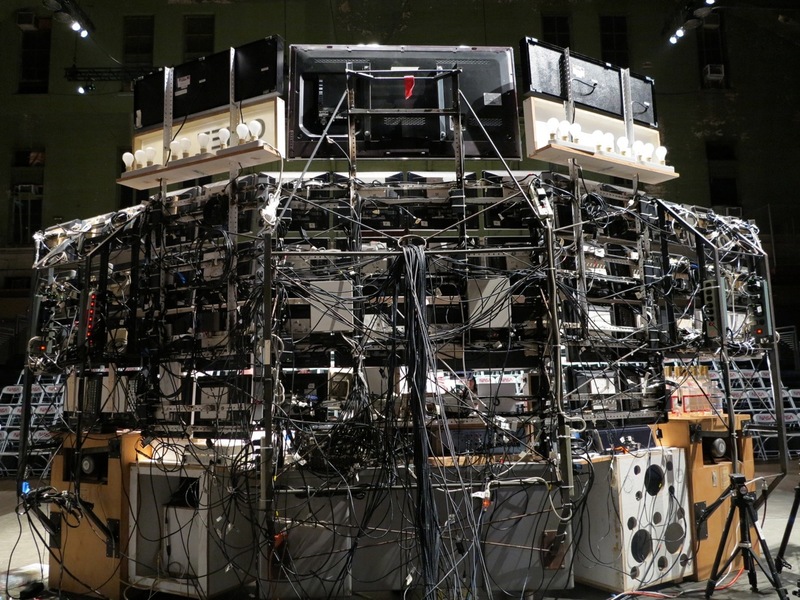 I went to see Tom Sachs Space Program: Mars in the cavernous Drill Hall at the New York Armory. Sachs has assembled all the equipment that a successful mission to Mars will require: space modules, mission control panels, communication system, food delivery and waste disposal systems, land rovers, tools, bolts and other bits, with real time demos by a dedicated crew. You can read about it here at the NY Armory website. . I’ll also recommend the video, which you can see here. Space Program: Mars is a complex three part concept, wrapped up as event. It’s a funny spoof, a low-tech knockoff. Chock full of junk, the mission to Mars has been is built out of everyday debris found objects, plywood, radios, brooms, vacuum cleaners, and other objects held together by cheap screws and duct tape (?). There are lots of NASA logos on ridiculous things. The definite sense is that the whole project is fueled by vodka. Men and women in lab coats make themselves busy, scanning computer monitors, adjusting dials, communicating via radio communication. It’s tipsy. But for all that, I found it to be a genuinely awe inspiring immersion into simulated sights and sounds and the adventure of space travel. You are invited in to walk around and take a close look. You can’t not be impressed by the meticulous planning and thoughtfulness that have gone into this project, including, according to the reviews in the press, input by “real NASA scientists.” It’s quite thrilling. You walk up the stairs and into the Armory off of Park. You walk through the dark foyer of the Amory off Park Avenue before entering the main drill room. Forced to turn a corner, you then enter the massive, brightly lit space of the Mars mission. It’s the big space that grabs you, and the intense kleg lighting, flashing monitors, sounds of clipped metallic communication, and the endearing charm of the young crew working the installation. This entry was posted in uncategorized and tagged art, Museums & Galleries, New York, technology. Bookmark the permalink.